Lent is not an ordinary time. It is a period in which we are called to reconsider our relationship with God while we go on living our “ordinary” lives. We are asked to fast from ordinary things, to nourish ourselves more from the Gospel, to strengthen our prayer, to intensify our charity towards the weak and to convert our hearts to the Lord just as we also go about the regular routine of our lives these forty days. In many ways this ordinary extraordinary is given full expression in the story of the Transfiguration (Lk. 9:28b-36). Jesus invites Peter, James and John to journey with him up the mountain to pray and there he is transfigured before them yet they must return back down the mountain when it is all over to the ordinary of their lives. It does raise the question of how much of a separation there really is between the “ordinary” and the “extraordinary” in life – maybe not as much as we often suppose. Today’s Gospel teaches us that the key to life is learning and being enabled to see the extraordinary in the ordinary. In other words; to see with transfigured eyes. The Catholic Center where I minister is situated in a large and old house. The chapel is located in the basement. 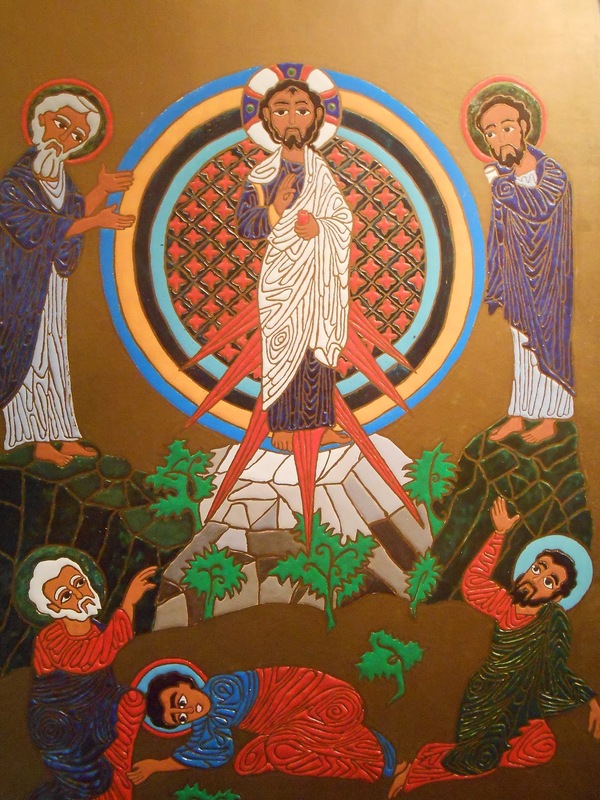 A few years back we placed a simple icon of the Transfiguration (pictured) in the stairwell leading down to the chapel. The icon is not there just to fill in a blank wall. It has a purpose. The visual theology of the icon instructs all who enter into the chapel for liturgy and prayer that we are entering into a place of transfiguration. Here, in the Mass and in quiet prayer, Christ is truly present and he reveals himself to us. There are a number of dynamics present in the movement of Transfiguration. The first and primary movement is that God comes to us. Before Christ takes the three disciples up the mountain to pray, the Son of God who, though he was in the form of God, did not count equality with God a thing to be grasped, … emptied himself, taking the form of a slave… (Philippians 2:6-7). This is always the first move. The second movement is that Christ tears us away from the selfish and mean habits that keep us so often bound. Christ tears us away from our selfishness and carries us higher. Here, let us avoid the danger of self-congratulatory pop therapeutic lingo which is really just a manifestation of spiritual sloth. Each and every one of us has selfish attitudes which we need to be torn away from. If the very disciples who walked with our Lord in the flesh needed to be pulled away from their selfish and mean habits then so do we. Today’s Gospel says, Jesus took Peter, John and James and went up the mountain to pray. The operative word here is “took”. He did not ask, he did not request. He took. Every time we gather for the Sunday liturgy, we encounter Christ who takes us from our own little preoccupations, worries and sad divisions and are drawn into the life of Christ himself – his vocation, his mission and his journey! Talk about an adventure! We are drawn into the very life of God and the mission of the Kingdom! This is the third movement. This brings us to an important point which is so often misunderstood in our day, both by those who have not encountered Christ as well as many who profess Christ. Jesus does not like to walk alone. Jesus does not see himself as the solitary action movie hero, almost condemned to be superior to everyone else. Christ binds himself to that first little group of followers and he kneads his very life into theirs even though he knows they are weak and limited. Throughout history Christ has continued to knead his very life into the life of his Church and he does so today even as he is aware of our weaknesses and limits. Jesus is that true shepherd who never grows tired of his friends and who always takes them with him. When we enter into the Eucharistic celebration not only do we receive the Body and Blood of Christ but we ourselves are also kneaded more deeply into the very life of Christ and into a life of communion with others. As we live this mystery of the God who comes to us, who tears us away from our selfish and mean habits and who kneads his very life into ours we are brought more into the very Kingdom of God and we begin to recognize that the ordinary and the extraordinary are really not that far apart after all.